There is a lot of hype around chatbots, AI, AR/VR, machine learning – and other emerging technologies. There’s also a lot of confusion among attendees and event professionals with the concern of having to add ‘one more app’ when it comes to events. MeetingPlay, however, in our ongoing commitment to success and innovation, is pleased to share that our next generation of mobile event apps can include each of these features - helping event professionals delight their attendees and meet the goals and needs of their events. Generation 4 of MeetingPlay mobile event apps are rolling out with three main elements being featured: augmented reality, artificial intelligence, and chatbots. Augmented reality allows attendees to view hidden computer-generated content via a marker (viewable target) without any special or wearable equipment. If you're wondering how this could help with your meeting goals, let us share an example of something we are working on with a client now. At Marriott's upcoming conference, their goal is to educate attendees on all 30 of their brands. Throughout the conference, augmented reality targets (physical cards that can be scanned by attendees’ phones) will be present. These targets will allow attendees to use the mobile event app to see an image that cannot be seen outside of the app (a token). If the first image to pop up after an attendee has scanned a target is a pair of running shoes and a clue about one of the brands, the attendee can make the connection that the brand is athletic or wellness oriented. When these attendees return to their home offices after the convention, they will take the tokens with them and can share them with their colleagues, continuing the same fun, slick experience of augmented reality and furthering the brand education. The fun and engaging component of augmented reality at the conference transforms what would have once been a simple educational experience into a gamified adventure amongst attendees, developing brand ambassadors. MeetingPlay’s 4th Generation of mobile event apps utilizes artificial intelligence to bring attendees experiences that they didn’t even know were possible! 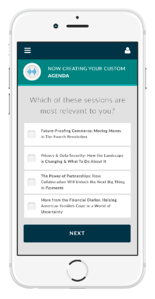 When attendees first open the mobile event app, they will answer a few simple questions about their interests, potential sessions they would like to attend, and their purposes for attending the event. Similar to Netflix, the mobile event app will then custom cater content that is relevant to each individual, suggesting sessions and speaker series that an attendee may not have had on their radar but would be of interest. Through this matchmaking algorithm, attendees are able to get the most out of the conference and experience sessions and information that are new and exciting! For meeting and event planners, this means attendees receive the most relevant information in a truly customized experience within the mobile event app. It means attendees who may have previously missed out on a session because they were only viewing a specific agenda track can experience more content. It means more attendees will engage with the many uses of the event app because they aren’t being served irrelevant content and information, which can lead to event app fatigue. And most importantly, it means attendees are discovering sessions, consuming event content, and experiencing the event in meaningful ways. At MeetingPlay, we pride ourselves on being the premier white-glove event technology service. We cater to our clients, helping them meet the goals of their events and conferences. Chatbots, which will be available in MeetingPlay’s Generation 4 of mobile event apps, are a reflection and continuation of this dedication, enabling us to give attendees exactly what they need. 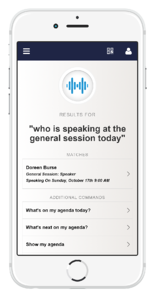 By using voice or text commands, attendees can ask the event app questions (such as “where is the general session?” or “what time does dinner start tonight?”) and receive instant answers. MeetingPlay continues to commit to bringing the events industry the experiences and technology that attendees desire and best reflect event planners’ goals. That commitment means, as the premier all-in-one event technology solution, we continue our non-stop innovation. Generation 4 of MeetingPlay’s mobile event apps with augmented reality, artificial intelligence, and chatbots reflect that continued dedication! drop us a line or request a demo now! Or check out what's new at MeetingPlay here.